Cosmofin is a reinforced high quality flexible PVC (Poly Vinyl Chloride) single ply sheet membrane that is manufactured in Germany by Wolfin Membranes. Cosmofin membrane is suitable for waterproofing flat roofs, balconies, terraces, podium slabs, under tile & paver applications, retaining walls, planter boxes etc. The Cosmofin membranes are 1.5mm thick, light grey and available with or without fleece backing allowing for all types of installation including bonded, loose laid, ballasted or mechanically fastened applications. All waterproofing contractors, waterproofing applicators or waterproofing specialists can install Cosmofin Membrane System. The Cosmofin range has been manufactured & designed as a full ancillary system incorporating all it’s own components integrated with the membrane to ensure total compatibility and provide the complete waterproofing system. COSMOFINSTEEL – 24 gge galvanised steel with membrane factory bonded to one side. Five standard profiles shapes are always available in stock and specials are made to order. COSMOFIN LIQUID – Used to seal laps on cut sheets to close reinforcement ends. Package size: 1L tins. TK 400 STRIP BONDING ADHESIVE -The recommended adhesive for strip bonding of Cosmofin LLV to most substrates where adhering is required. TK 400 can be installed over existing membranes, damp substrates and is applied using 60cm Lance Applicating Gun. COSMOFIN CORNERS – Preformed internal and external corners for a tighter neater look. The Cosmofin Membrane welds directly to the corners. WOLFINATOR – Wolfinator is a structural grade adhesive that has been specially formulated for the bonding of Cosmofinsteel to absorbent & non-absorbent substrates including metals, ceramics, timber, glass, etc. It will also adhere to slightly damp substrates. THF – Tetrahydrafuran cold welding solvent, for cold welding overlaps & connection of the membrane to PVC pipes. UNIVERSAL PINS – The Universal Pins are the solution for fastening items directly to the Cosmofin Membrane without piercing the membrane itself. The product has an 80mm diameter base plate, which is made of Wolfin membrane (with a protruding 25mm vertical threaded bar and locking nuts) and is welded directly to the Cosmofin membrane for the securing of ballast retainers etc. PROJEX NON-SLIP WALKWAY – Projex Walkway Matting is a permanent non-slip solution that is welded directly to the Cosmofin membrane system. This special mat is used to create safe walking paths in places where it is needed. If necessary, it can also be installed across the entire waterproofing application to achieve a total non-slip finish. Projex walkway matting provides excellent anti-skid properties for pedestrians as well as adding extra protection to the membrane in these high traffic areas. The product is dark grey and comes in roll of 15m long x 1.06mm wide. It is easy to install. Simply align, unroll and hot air weld it to the waterproofing membrane. 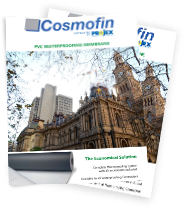 Why Waterproofers like working with Cosmofin? One of the main reasons Waterproofing Contractors prefer the Cosmofin Membrane System is that it’s supplied as a full ancillary package including 3 versions of the Cosmofin Membrane (F, FG LL & FG LLV), factory bonded profiles, pre-made corners, welding solvent for connecting directly to PVC pipes & is manufactured in Europe. It is supplied as a full complete system. Cosmofin Membranes can be installed over most substrates including damp, can be bonded or loose-laid & are backed by Projex Group offering full support & service with all installations. To speak to a Projex representative, please enter your details below. We will respond to your enquiry in the next 24 hours.